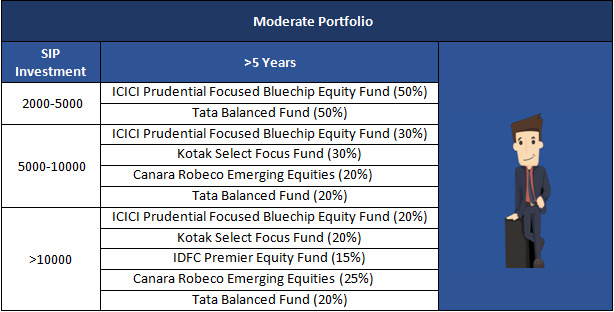 Our SIP Portfolios which investors can consider investing in for the long term. If you remember the childhood story of the Tortoise and the Hare, then the Systematic Investment Plan (SIP) is equivalent of the tortoise in the race to create wealth. Systematic Investment Plans, or SIPs as commonly known, offer benefits while making sure that you continue moving slowly but surely to win the race in money matters. SIP, also known as Regular Savings Plan (RSP) in some countries, allows you to invest a fixed amount at pre-defined frequencies in mutual funds. A recurring deposit offered by bank or post office is the only other investment option that is similar to SIP. As SIPs require you to invest periodically and continuously and over time, SIPs make periodic investing more of a habit. By regularly investing you tend to be more focused on achieving your financial goals. This brings in investing discipline. i) One has to identify and research stocks that are undervalued to invest in them. ii) Even after investing in the stock, one is not guaranteed of the returns. Rupee Cost Averaging (known in the West as Dollar Cost Averaging) is an investment strategy widely used by investors all over the world. This calls for you to invest a fixed amount of money regularly (on a monthly, quarterly or yearly basis) in a disciplined manner. The main benefit of RCA is that it takes the guesswork out of investing and thereby the need to time the markets. If the price of the fund increases, you would naturally be able to subscribe to a lesser number of units. You would buy more units during market slumps and fewer units during market up-turns. Most SIP schemes require you to put in very low amounts. The amounts can be as low as Rs. 500 to Rs. 1,000 per month and some schemes have even lowered the bar by requiring you to pay Rs. 100 only per month. 1) Decide on the monthly investment amount that you can sustain over the investment period. For example, it can be Rs.1,000, Rs. 2,000, Rs. 5,000 or any amount that you are comfortable with. 2) Select the funds in which you want to invest through SIP, but make sure that the portfolio is diversified. For example, you can invest Rs.500 in 10 mutual funds or Rs.1,000 in 5 funds if you had chosen Rs. 5,000 as the sustainable monthly investments in the previous point. 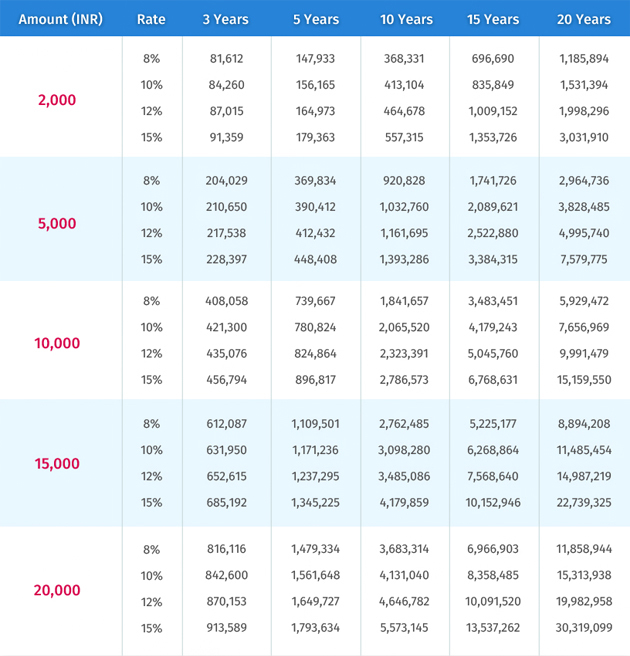 Illustrative Table That Shows Growth of a Defined Monthly Investment at a Defined Rate of Growth Every Year. The Research Team is part of iFAST Financial Pvt Ltd. The growth rate and/or return on investment in the above table is purely for illustration purpose and should not be construed as a rate of return offered under any of the SIP portfolios recommended in this article. iFAST and/or its content and research team's licensed representatives may own or have positions in the mutual funds of any of the Asset Management Company mentioned or referred to in the article, and may from time to time add or dispose of, or be materially interested in any such. This article is not to be construed as an offer or solicitation for the subscription, purchase or sale of any mutual fund. No investment decision should be taken without first viewing a mutual fund's scheme information document including statement of additional information. Any advice herein is made on a general basis and does not take into account the specific investment objectives of the specific person or group of persons. Investors should seek for professional investment, tax, and legal advice before making an investment or any other decision. 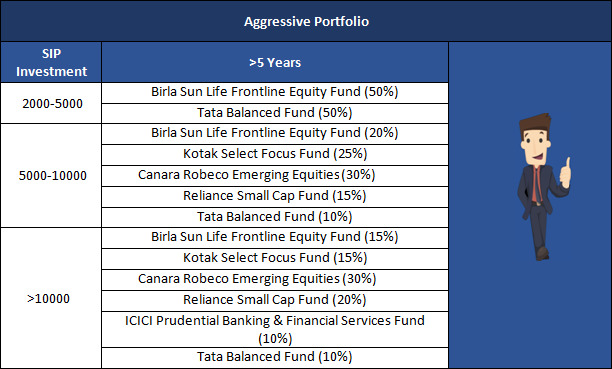 Past performance and any forecast is not necessarily indicative of the future or likely performance of the mutual fund. The value of mutual funds and the income from them may fall as well as rise. Opinions expressed herein are subject to change without notice. Please read our disclaimer on the website.Please read our disclaimer in the website.